Jenne K. Britell, Ph.D., is the Chairman of the Board of United Rentals, Inc., the world’s largest equipment rental company, as well as a director of Quest Diagnostics, Inc. and a member of the Board of the Santa Fe Opera. She was named the 2011 Director of the Year by the National Association of Corporate Directors and one of six Outstanding Directors of public companies for 2011 by the Outstanding Directors Exchange. 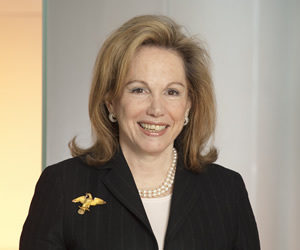 In 2012, she was elected as a member of the Council on Foreign Relations. Dr. Britell is a former senior executive of GE Capital where she served as Executive Vice President of Global Consumer Finance and President of Global Mortgage and Commercial Banking. Previously, she was President and CEO of GE Capital, Central and Eastern Europe. Previously, Dr. Britell held senior positions at Citicorp and Republic New York Corporation, was a director at Lincoln National Corporation and West Pharmaceutical Services Inc., and a trustee of TIAA-CREF. Dr. Britell served as the first Chairman of the Polish-American Mortgage Bank, a joint effort of the Polish American Enterprise Fund and two Polish entities. The bank was the first, modeled on Western practices, to be established in post-World War II Central and Eastern Europe. She was also a Senior Advisor to eBay and PayPal, to the Polish American Enterprise Fund, and to the Baltic-American Enterprise Fund. Dr. Britell received her B.A., with honors, and M.A. from Harvard University and her M.S. (business administration) and Ph.D. from Columbia University.